Easter is a big holiday in our household. The entire day is filled with church, family, and food. The church part is pretty much taken care of on its own and has been for hundreds of years. The family part is easy because you were born into one and have more than likely brought your own little family into the picture. But, that leaves one little issue left to cover…the food! Are we going out instead? Will there be enough time to get everything done and still have time to spend with the family? Probably not. There is one place that can help take the weight off your shoulders, a load off your mind, and keep you out of the kitchen more this Easter. HoneyBaked Ham is that place. 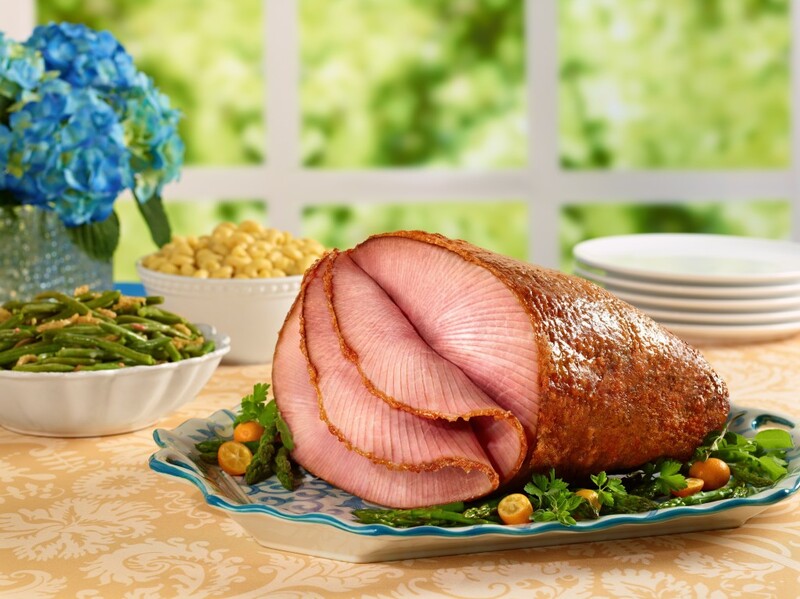 For three generations HoneyBaked Ham has been committed to bringing the authentic, spiral-sliced and glazed ham as well as other phenomenal products they’ve become legendary for. Whether it’s traditional you’re looking for or leaning in the direction of starting new traditions, HoneyBaked Ham has you covered. You can stay traditional with the classic HoneyBaked ham, or any of their mouthwatering turkey selections, or you can think outside of the box with a sandwich bar. A winning combo includes tender HoneyBaked Ham, Swiss cheese and golden yellow mustard. However, if you really want to be bold and think differently this year…think beef. From prime rib to tenderloin, HoneyBaked is your source for the finest beef dishes. Pot Roast, Sliced Beef Brisket, and even Beef Wellington are some of the choices that you could bring to your table this Easter. And it doesn’t stop with the entree’s. With side dishes like Broccoli Rice Casserole, Yukon Mashed Potatoes, Green Bean Casserole, Sweet Potato Soufflé, and Cornbread Dressing, no one will the leave table hungry this Easter. To help you with your Easter lunch or dinner, I have a $50 HoneyBaked Ham gift card for one lucky reader. I like the tradition of hunting for eggs. My favorite Easter tradition is having brunch with my friends. Easter Egg Hunts Are My Favorite Easter Tradition! I love coloring eggs with my girls. We have so much fun making them as colorful as possible. Thank you! I love decorating eggs every year! My favorite Easter tradition is hiding candy filled eggs in the backyard and hunting for them. The whole family getting together and our huge feasts!! The kids getting baskets full of goodies. THAT was my favorite thing as a kid and now I know it is the grandkid’s favorite too. I love hunting for Easter eggs. We just like to get together. Easter egg hunt for the kiddos. watching the kids running around looking for eggs is the most fun. Now that I have kids it is watching them hunt for eggs and get into their Easter baskets. I like trying out new side dishes o Easter. I love coloring eggs with the kids. My favorite tradition is when my older nephews hide eggs for their younger cousins. Hiding the eggs for the kids. I like the Easter traditions of church, family meal, and egg and basket hunt. Our favorite easter tradition is the easter egg hunt. We have never had Easter traditions, but this year we are starting one. My son is having everyone over for Easter and we are planning on continuing with this. I love having my family around the table. The family Easter egg hunt. I love the easter egg hunts and chocolate! I love dying eggs with my boys! I enjoy the late lunch after the egg hunt with the whole family. I enjoy the family late lunch after the egg hunt. coloring eggs with the children and vacation! Having an Easter Egg Hunt in the backyard for the kids – now grandkids. My favorite tradition is… before our family has Easter Dinner. We each state what we feel we are blessed with and are thankful for. My favorite is the easter egg hunt with the kids! I love having baked ham every year for Easter! I don’t have ham too often, usually just holidays. We color and then hide Easter eggs. My favorite tradition is Easter Mass. We love hunting for Easter eggs and eating chocolate bunnies! for me it is finding easter eggs. i never grew out of it. We always have a super fun (& messy) egg toss. We all go to my aunt’s house for dinner, and then we have an egg hunt for the little kids. We love getting the family together for an Easter dinner. My favorite Easter tradition is the Easter Egg hunt! My favorite Easter tradition is to dye eggs the night before. Our big annual easter egg hunt. I like decorating the Easter eggs! It is fun painting them and spending time with others doing so ! Watching the kiddos enjoy their Easter baskets. My favorite is the huge Easter egg hunt for the children at my grandmother’s. Eating ham and watching the kids do the Easter egg hunt. My favorite Easter tradition is watching my son look for his eggs. The easter egg hunt is great. Coloring eggs and eating candy! My favorite is the chocolate candy and making potato salad with the Easter eggs. My favorite Easter tradition is coloring and decorating eggs. The whole process is relaxing and fun. I like to see how all of the eggs turn out. I try to do something different with them every year. Having an Easter Brunch after Mass. Making jello eggs every year and trying to get them out of the mold in one piece. Since my Dad passed away four years ago, I make sure to put Easter lilies on his grave every Easter. We have a huge extended family gathering at my mother in laws house complete with a hunt for the kids. I love watching the children participate in the Easter egg hunt. They are always so excited! Coloring Easter eggs and hiding an Easter basket for my 67 year old husband…sounds weird but it’s fun. I like dying easter eggs. Easter egg hunts with family & friends. Easter dinner with the family. After dinner walk with the family! I think my favorite tradition is coloring and hiding the eggs for the children to hunt. My favorite is the Easter Bunny leaving a basket of treats for the kids to find on Easter morning. My favorite part of Easter is the dinner we have with family. My favorite Easter tradition is doing an Easter egg hunt for my grandsons! My favorite Easter tradition is coloring Easter eggs with the kids. there is a certain restaurant all of my family goes to…all the extended family. It’s great to get EVERY one together! We have Easter supper with the whole family at Grandmas house. My favorite Easter Tradition is going on the community Easter Egg hunt as a family. Spending the afternoon with my entire family. Easter Egg Hunt at our church!! I love the Sunrise Service and the dinner with family. Easter egg hunt with all the kids in the family! My favorite Easter tradition is having a big family ham dinner. hunting eggs with the kids is my favorite part of easter. I like to dye eggs with my family. Kids hunting eggs at the grandparents’! I love coloring eggs with my family. The egg hunt with the little ones. They are sooooo cute! I love watching the kids scavenger hunt for their easter baskets! Our favorite tradition is coloring of the eggs, it’s a great time to get a little messy. My favorite tradition is having family over. My favorite tradition is to dye Easter Eggs. my fav Easter tradition is getting with the family and egg hunting after a meal. I love going to church on Easter morning as a family. Also dying Easter eggs the night before. My favorite tradition is the ham dinner we always have after our egg hunt. My favorite Easter tradition was to enjoy all the family that came to my parents house. It was like a family reunion. Love the family egg hunt! I like dying Easter eggs! My favorite Easter tradition is decorating Easter eggs. I’ve always really loved dying eggs! Going to church in the morning! My favorite tradition is the Easter Egg Hunt with the kids. i love going to church on Easter. Having the whole family and friends enjoying dinner. I like having an Easter egg hunt outside. We dye and hide eggs for the kids after church. My favorite tradition is enjoying a nice ham dinner and watching a movie with my family. This might change this year with my little nephew. I would love to hide Easter eggs for him. Going to church on Easter Sunday. We have an Easter egg hunt for our grandchildren every year! That is our tradition. My favorite tradition is Easter dinner w/the family. Our favorite Easter tradition is going to sunrise service at our church. We have a tradition of arranging an Easter egg hunt for the children in our extended family. Our tradition is taking our chiweenie Emiline to the Mom-Mom’s to partake in the spoils of easter dinner. She’s been going there for alopst 13 years now. Thanks for the giveaway… Easter Egg Hunt with our kids ! My daughter and I go shopping the day before Easter, go out to eat and then go home to color eggs.